The technology of acoustical imaging has advanced rapidly over the last sixty years, and now represents a sophisticated technique applied to a wide range of fields including non-destructive testing, medical imaging, underwater imaging and SONAR, and geophysical exploration. Acoustical Imaging: Techniques and Applications for Engineers introduces the basic physics of acoustics and acoustical imaging, before progressing to more advanced topics such as 3D and 4D imaging, elasticity theory, gauge invariance property of acoustic equation of motion and acoustic metamaterials. The author draws together the different technologies in sonar, seismic and ultrasound imaging, highlighting the similarities between topic areas and their common underlying theory. 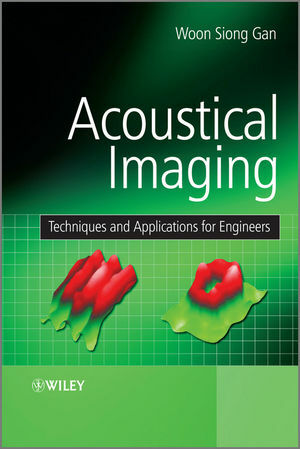 Acoustical Imaging: Techniques and Applications for Engineers is a comprehensive reference on acoustical imaging and forms a valuable resource for engineers, researchers, senior undergraduate and graduate students. Woon Siong Gan is the Director of Acoustical Technologies Singapore Pte Ltd. He obtained his PhD in acoustics from Imperial College, London in 1969, and since then has been conducting research into and published several papers on acoustical imaging. In 1989 he founded Acoustical Technologies Singapore Pte Ltd, an R&D company involved in the development of ultrasound technologies especially in high frequencies acoustical imaging, and has several patents granted in scanning acoustical microscope (SAM) and surface acoustic wave(SAW) devices.